I originally wrote this article for The Welsh Railways Archive, published by the Welsh Railway Research Circle, and it appeared in Volume 4, page 88ff, November 2006. Since publication some additional information has come to light and it is included in this edited version. 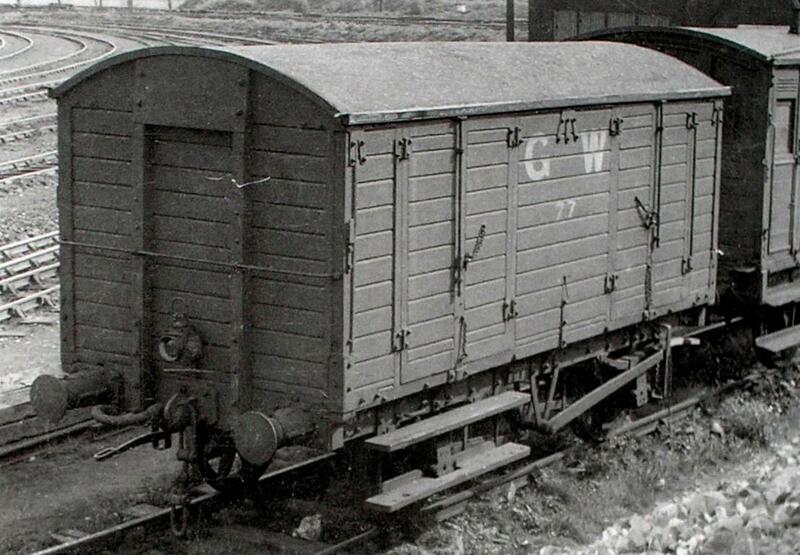 Covered Goods was the term used by the Rhymney for wagons that we would normally call vans. I have tried to keep with the Rhymney terminology throughout this article. 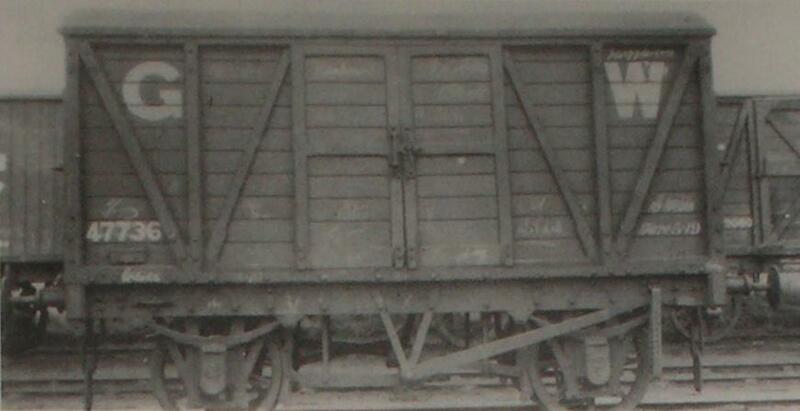 Type 1 15'6" outside frame with sliding doors on a 9' chassis. 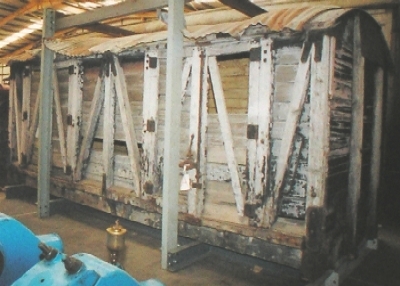 Type 2 18' long outside frame with two pairs of hinged doors. Chassis details unknown. Type 3 18' flush side with two pairs of hinged doors on 9'9" chassis. This van has been converted to departmental use and has been fitted with vacuum brake, screw couplings and footboards. It is reasonable to assume that these designs followed each other and there was no overlap of building different types at the same time. A(N&SW)D&R wagons are few and far between in the GWR wagon registers. 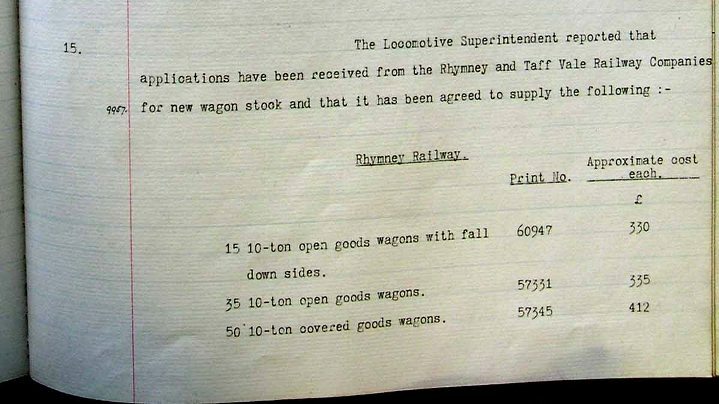 By contrast, almost all Rhymney covered goods appear in the GWR registers. 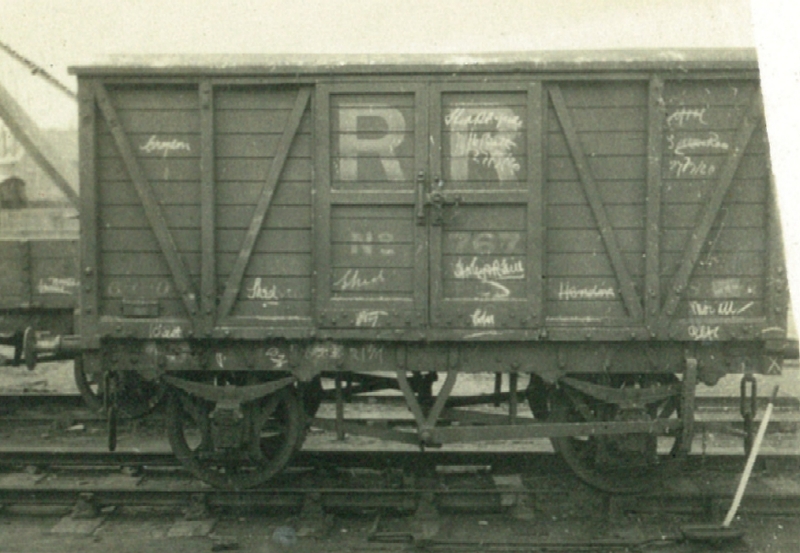 Part of the reason is that many Alexandra wagons were condemned on sight and did not survive to be renumbered. This is the first covered goods design built from 1903 until 1912. Typical details of the Type 1 design taken from the registers are given in table 1, and their numbers are listed in table 2. The most common tare was 5t 18c. The details and photo 1 tie up remarkably well with the drawing that appeared in Railway Modeller April 1976 p.113, of a Harrison & Camm design of which the Rhymney apparently bought 130 initially 8 ton load and later 10 ton. The only noticeable differences between the drawing and photograph are the axleboxes and V hanger. It certainly appears that the Rhymney used the Harrison & Camm design. According to the GWR wagon registers kept at York and Kew there were 32 built to this design between 1903 and 1912. A further 3 covered goods can be added to this list from those listed by J David(WRA Vol.2 p.157ff), numbers 99, 101 & 179. Numbers 101 and 179 were amazingly short lived covered goods. They were condemned in 1926, were not renumbered and do not appear in the GWR registers. Number 99 was rebuilt as a breakdown van before the grouping and presumably appears in the appropriate GWR register. Whether these covered goods were similar in appearance to Type 1 I cannot be sure, although I suspect they were. It is possible that the dimensions for these three covered goods are actually errors in the registers or differences in the way in which measurements was actually measured. At the grouping the Rhymney had approximately 165 covered goods of type 1, distinguishable only in their small details. There are no references to outside wooden framing or flush boarding in the registers relating to any Rhymney covered goods. However a clue may be gained from the tare weights recorded by the GWR. The tares for Type 1 covered goods range from 5t 15c to 5t 19c and the spread displays a slightly skewed distribution. The various batches of Harrison & Camm covered goods also display a range of tares over only a few Hundredweight, although the 1899 range was 8 cwt. The range of tares for covered goods built post 1912 is from 6t 11c to 7t 6c, ie the heaviest covered goods was 14cwt heavier than the lightest. Almost double any other batch of Rhymney owned covered goods recorded in the GWR registers. In 1916 a distinct change occurs. The first 23 18' covered goods built had tares in the range 6t 11c to 6t 19c. All but one of the remaining 10 18' covered goods had tares in the range 7t 1c to 7t 6c, with one of 6t 19c. Therefore I suggest that the first 23 covered goods were Type 2 and the remaining 10 Type 3. My big surprise whilst trawling the GWR registers was to find 50 covered goods that were built by the GWR for the Rhymney. Apparently, railway companies were not allowed to build stock for one another. Sharing this discovery with a couple of other wagon enthusiasts revealed that the GWR also built 50 opens for the Rhymney and 50 opens for the Taff Vale at the same time. John Lewis was able to find references to both of these orders in the GW, Rhymney and Taff Vale minutes books. The covered goods were built during July and August 1921. From the description in the register these covered goods appear to be the standard general merchandise covered goods of the time, which the GWR gave the diagram V16. Surprisingly, as most were renumbered and presumably re lettered by 1925, there is a photo of a V16 in RR livery, number 615. It appears in the background of a photo in Midland Record 0, p.30 taken at Birmingham Central, dated 26th September 1922. The register records that many of the covered goods were 'Stencilled'. This was to show the 'OPEN' and 'SHUT' positions of the ventilator operating handles. The GWR C&W registers are known to not be perfect and discrepancies do exist. However, they do give us a snapshot of the situation, even though it may be blurred in places. So far, I have been unable to look at those renumbered 85862 to 85894 (RR 711 to 792), so it is possible that more Rhymney built covered goods are in this sequence. As these are from the 1900 Harrison & Camm batch, I think it unlikely as there are only 2 rebuilt covered goods in the rest of the Harrison & Camm batches built between 1899 and 1904. The only area where I know of disagreement between what I have recorded from the GWR registers and what has been published before concerns the AM Gunn / MEM Lloyd drawing of a type 3 covered goods. Written on this drawing is a list of covered goods numbers, however, this list does not tie up with Jonathan David's (WRA Vol.2 p.157ff) article or the GWR C&W registers. Of the covered goods listed, 9 were type 1 according to both the registers and Jonathan David's article. A further 11 covered goods on the Gunn list were type 2 according to my theory. This leaves 5 covered goods that I agree were type 3 covered goods as per the drawing. It is also possible that there was only one type 2 covered goods and there is some other explanation for the large range of tares. Thanks must go to Steve Bromhall, Jonathan David, John Lewis and Clive Spratt who have helped by providing information they have gleaned from the registers at York and Kew and other sources. And also to the staff at Nantgarw for their help when I visited the collection. A model of a Type 4 van built from a Coopercraft kit.